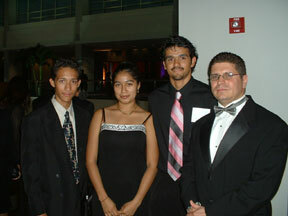 Jose Kafie, Alba Melendez, Danny Wymann, and their sponsor, Mr. Rodrigo alba of Ameriquest. I want to tell you about the Hispanic Caucus Awards for the Spanish community. These awards are for the important Spanish people who are successful and inspire Spanish people to be better in the future. I went there because Mr. Rodrigo Alba, a lawyer, was looking for young Latinos to go to the awards ceremony. I was very excited about all this because I was one of the two Blair students that were chosen. The other student was Alba Melendez. The big event was on September the 15th in the Washington Convention Center. We had to be there at the reception at 5:30 p.m. and the dinner was going to start at 7:00 p.m. We found out that they do this event every year and I was looking forward to that and I think Alba was too. Mr. Bellino went to get me and Alba at our houses, and he took us both to the big event. When we were over there Mr. Alba was waiting for us and he was wearing a black tuxedo and a black tie. Alba was wearing a black long dress and I was wearing a black suit, too. Right away we went to the upper level and we had to show our tickets to the security teams that were almost everywhere. After that we passed through a metal detector and we finally met the other student who was from Rockville High School. He is in the 11th grade and was born here in the U.S.
For most of the evening Mr. Alba introduced us to a lot of very important people. It was great to meet a lot of people. We met lawyers and legislators and all kinds of people. They were all nicely dressed and very respectful. They would talk to us like we were old friends and that made me feel good. Then a man told us to move to the dinner place and we did. We all agreed that we were hungry and everyone was moving in order even though there were a lot of people. We learned that they were not only from Maryland or Washington. There were people from almost from every state. Suddenly a lady asked for silence. Even though it seemed hard because they were talking about business or other things, everyone was quiet. Then they started to announce that they were going to start to give the awards to the Spanish figures while we were eating some food that was put on the table, (We had seafood and it was good!) They gave awards to a lot of people, even people who could not attend because they were working at that moment. It was really cool and we found out about other people that help the Spanish people from this country. They finished giving the awards and the waiters started to move to put the dinner food on all of the tables. We ate meat with rice and for dessert we had ice cream with cookies. Then out of nowhere Mr. John Kerry showed up and all the people started to clap for him and he started to talk about the Spanish people in America and how important is the role they play and that he needed our help to vote for him so the Spanish people can get what they want if they work hard. He talked in Spanish too and we all clapped for him because he was really good at it. After that we stayed for an hour more and we danced Salsa. It was really fun but then we had to leave. We went downstairs and a limousine was waiting for us and it took us to our houses. The evening was a really good experience where I learned about my culture and more things. I want to thank Mr. Alba of the Ameriquest Mortage Company in Washington, DC. He is the one who made all of this possible for us. Thank you, Mr. Alba!